Home Depot’s Parking Lot Advertising: "
During brainstorm/ideation sessions, any thoughts that are off-topic, off-base, or need future follow-up get written down in a proverbial parking lot. Well, some marketing ideas are best left on parking lots in conference rooms -- not in parking lots of retail shopping centers. Case in point ... a Home Depot parking lot in Austin, TX. Who are the ad creeps behind this ad creep? 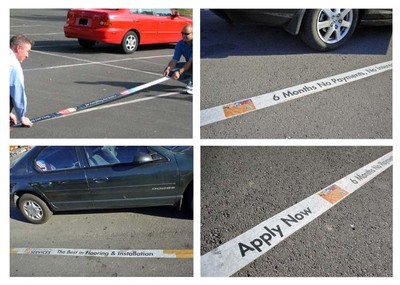 Parking Stripe Advertising are the creeps. Go and find my cash advance los angeles blog.